Fear not, dear readers, this is not a health food post. Believe it or not, egg whites play an important role in the wine making process, particularly when it comes to fine red wine production. 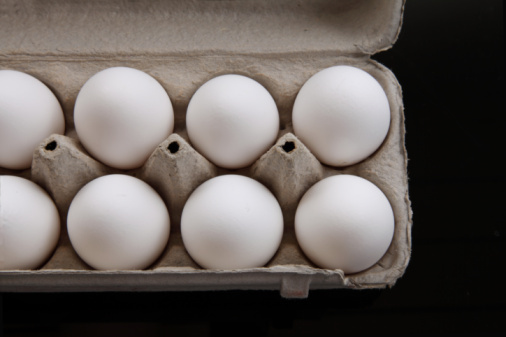 The albumen – from the Latin alba for white – found in egg whites are colloidal in nature and have a positively charged surface that attracts negatively charged tannins. Egg whites tend to remove fewer phenols and less fruit character than other fining agents, such as gelatin. Egg whites also tend to favor harsh and bitter tannins, leaving the softer ones behind in the wine. Fining is done to improve color and clarity, as well as to enhance flavor and stability. Five egg whites can do the job for a 225 l/59 gal barrel of young, red wine. Fining can save money for the producer (and for you) because it saves time – most fine wines held under good conditions for a few months would achieve the same clarity as fining. Other fining substances have been derived from milk, fish bladders, and American bentonite clay deposits. 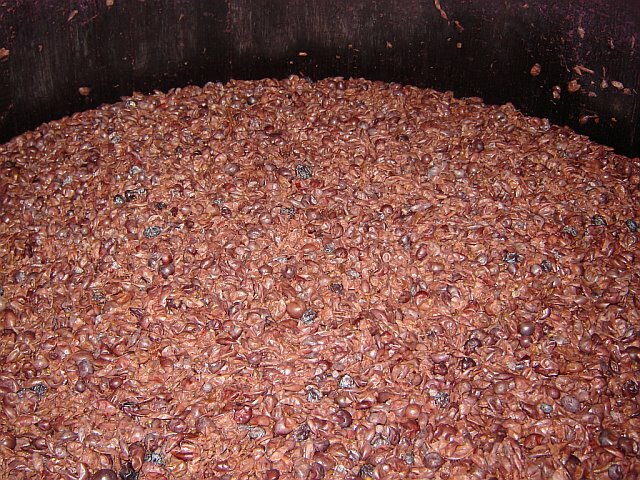 If any of this grosses you out, research conducted at UC Davis found that insignificant traces, at most, of any fining agent remains in the final wine. Nevertheless, many producers are moving away from animal-based products for the sake of vegetarians and vegans. In the late 1990s DNA profiling determined that Petite Sirah in California was a field blend of Peloursin, some actual Syrah and mainly Durif, which is a crossing of Peloursin and Syrah. Let’s break it down. Petite Sirah is a darkly-colored, fairly tannic grape grown in warm climates like California, South America and Mexico. Sometimes it’s bottled as a single varietal – I especially like the ones from Elyse, Judd’s Hill and Neal Family – these wines are bold, with spicy blue and black fruits. At other times it’s used to beef up red blends. A field blend, not as common as it once was, is a mixture of different varietals planted in the same vineyard. Peloursin is an obscure French grape, now found in California and Victoria, Australia. A crossing is when two varieties within the same species are combined to create a new varietal. Think Pinotage (Pinot Noir x Cinsault) or Müller-Thurgau (Riesling x Sylvaner). Durif was spread into southeastern France in the 1880s by Dr. Durif and while it was resistant to diseases such as downy mildew, it didn’t really produce any high quality wine and the French authorities weren’t too keen on having it very widely planted. You can now find it in North and South America and several areas of Australia; Rutherglen, Riverina and Riverland. 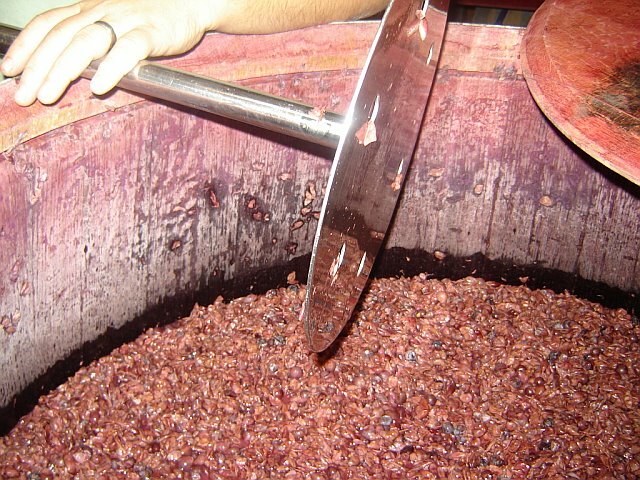 The cap (chapeau in French) is the layer of grape solids that forms on the surface during red wine fermentation. Fermenting Mourvedre at A Donkey and Goat winery in CA. I got to sample a grape and it was like eating pop rocks, because of the CO2 forming as a by-product of fermentation. 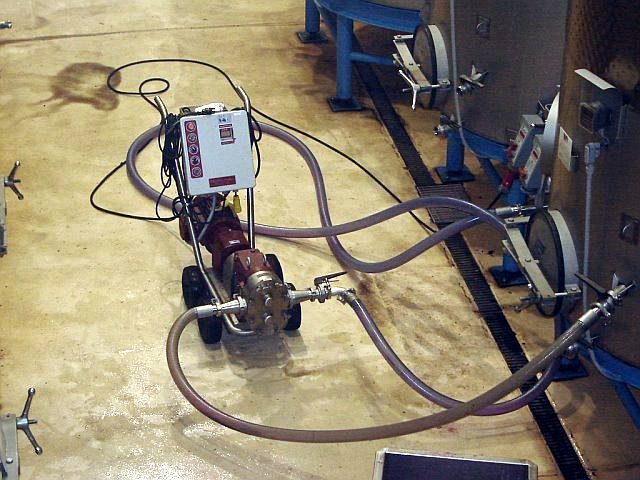 The cap limits the oxygen available to the yeast, encouraging them to eat away at the grape sugar to form alcohol. 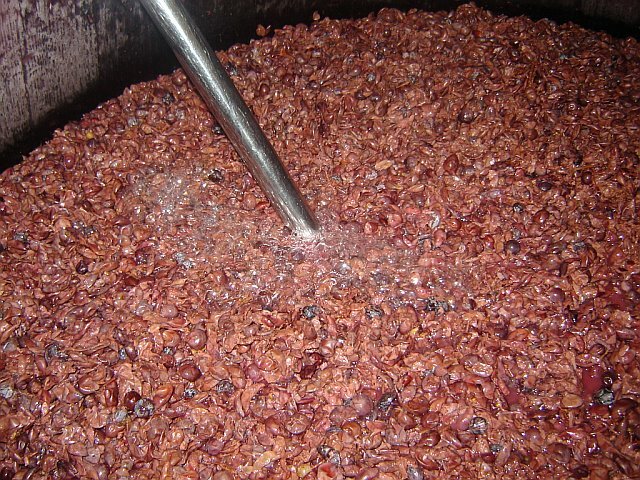 The cap must be broken up and mixed back in with the liquid below, however, in order to extract the phenolics, which add color, flavor and longevity to the wine. Phenolics can be found throughout the grape, but are particularly rich in the skins, seeds and stems (the solids!). On a smaller production scale, the winemaker will “punch down” the cap several times per day. Jared showing off his stainless punch down tool. The punch down tool breaking through the cap. Notice the bubbles. Jared told me the cap would support his weight and he's not a little guy (he volunteered that information, too). On a larger production scale, the winery will “pump over” the cap. A pump doing its thing at Miner Family in CA. 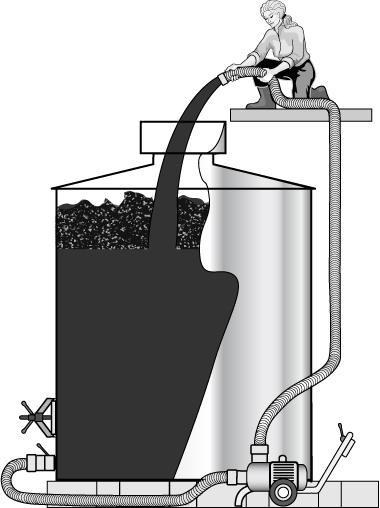 We recently had an illustration created to use in our classes to explain how pumping over works. 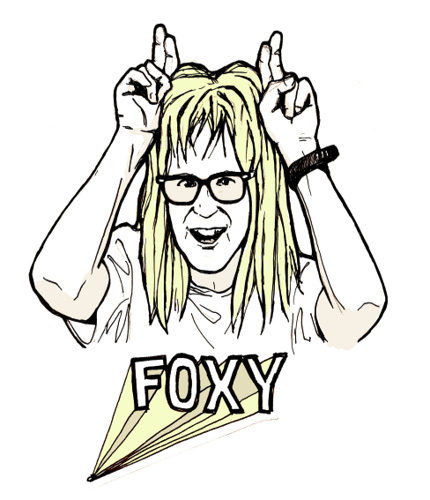 Thanks, Laurel. Flushing the liquid back over the cap to break it up, using a pump. My favorite part of this illustration is the female winemaker. Most of the wine we drink is made from grapes from the Vitis Vinifera species. Vitis is the genus for many vine plants and vinifera comes from the Latin “to bear or carry wine”. This species started out in what is now Iran and made its way out of the Middle East and into the Mediterranean. From there, the Greeks spread the vines to North Africa and southern Italy. The Romans then brought them along as they began occupying the western part of Europe, as early as the 1st century B.C. Simultaneously, North America had land under vine, but the vines were all non-vinifera species, with fun names like Vitis labrusca, Vitis riparia and Vitis aestivalis (there are 15+ total). When phylloxera (insect/epidemic that kills grapevines) struck Europe, they didn’t want to plant our vines, but they were interested in our phylloxera-resistant rootstock. 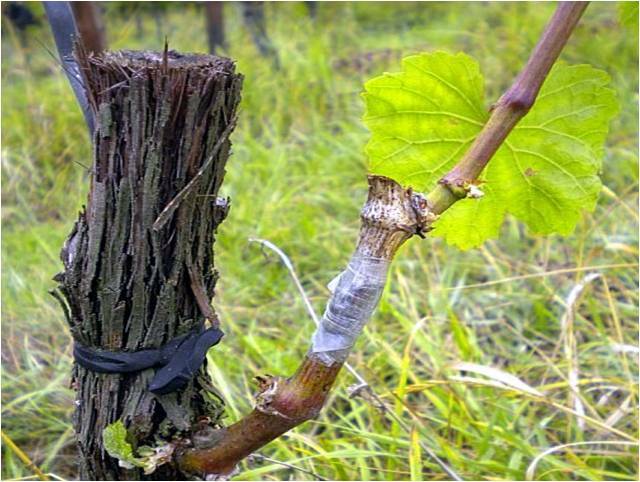 The solution was grafting the more desirable vinifera vines onto the hardier American species. Grafted Riesling vine. Grafting is done by cutting a cane (stem of a mature grapevine) of the desired variety in a way that it will fit into a matching cut made in the selected rootstock (think of a puzzle piece). Grafting took many years to perfect, but it was just the beginning of experiments done by botanists. By the late 1800s scientists were cross-pollinating different vine varieties and families. French-American hybrids were born of these experiments. The idea was to combine the winter-hardiness and phylloxera resistance of the American vines with the fruit and flavor of the French vines. We’re still developing these varietals, particularly at the Cornell Viticultural Research Station in Geneva, New York. At one time hybrids accounted for several million acres of vineyards in France. This is no longer the case, though hybrids can still be found in the eastern U.S. and Canada, and South America. Interestingly, one hybrid has survived in France; Baco 22A. Sometimes called Baco Blanc, it is a crossing of Folle Blance (acidic, French white, ravaged by phylloxera) and Noah (hardy American hybrid developed in the 1860s in Illinois), and was created by François Baco in 1898. Until the late 1970s, Baco 22A was the primary ingredient in Armagnac. 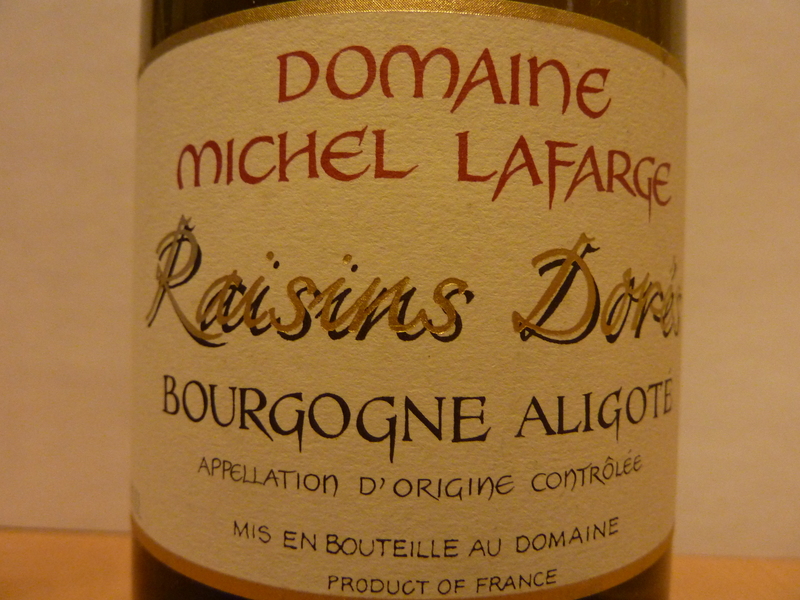 Ugni Blanc now plays a bigger role than Baco22A, as French authorities try to rid their vineyards of hybrids.